The new Bolt is an affordable EV with great mileage. General Motors has released its first mass-market fully electric vehicle and sales are picking up steam. The Chevy Bolt, named Motor Trend’s 2017 Car of the Year, is giving electric vehicle heavyweights like Tesla a run for their money. The Bolt is the first economically-priced EV offering more than 200 miles of range in the United States. We’ll take a closer look at all of the features that GM’s newest model has to offer, and see how it stacks up against competitors in an ever-increasingly hot market of electric cars. While GM has been a well-known American car producer for years, it barely survived the financial crisis. The company filed for bankruptcy in 2009 after being bailed out by the federal government, and many felt that the years of GM’s success were over. Less than a decade later, the company is raking in cash from its list of new and successful vehicle models — among them the Chevy Bolt. The Bolt isn’t GM’s first foray into all-electric vehicles. They had been experimenting with adding electric batteries to cars for years – starting way back in the ’70s with the Electrovette and, most notably, with the ill-fated EV1 of the 1990s. Thanks to its strong post-recession financial comeback, the company took a leap of faith and created the Bolt – a car designed to go head to head with the ever-popular Tesla. Before we go any further, let’s make a clear distinction between the Chevy Volt and the Chevy Bolt. They have very similar names but their build and power source are very different. 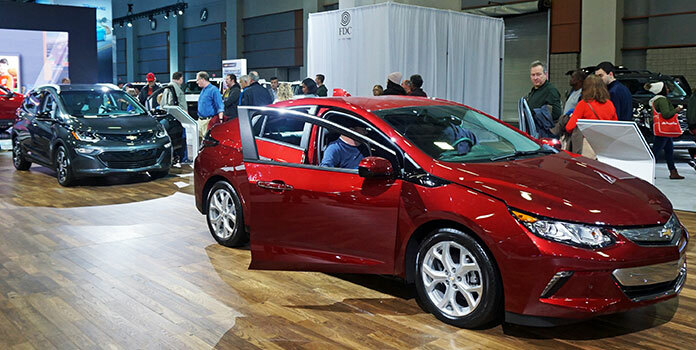 The Volt is a mid-sized plug-in hybrid vehicle, while the Bolt is GM’s first 100 percent electric, mass-market vehicle. Similar to the Tesla Model 3, the Bolt is offering a mile-range that is far above the market average for EVs, at a price closer to what most people can afford (unlike most of Tesla’s models). This combination of high mile-range and low price is of top importance for all electric powered vehicles, given that the average range is still far away from competing directly with conventional, gas-fueled cars. Consider that in December 2017, the Department of Energy published statistics on the increasing mile-range of EVs. The data compares model year 2011, when there were only three all-electric vehicles on the market, to 2017, with 15 different all-electric vehicles. Within this six year span, the average mile-range has gone up 41 miles, from 73 to 114. 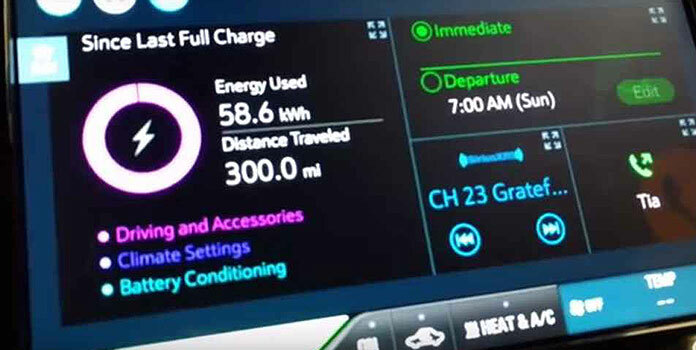 While the speedy improvement in technology is impressive, these numbers can still leave EVs drivers craving more when they compare their EV’s range to gas-powered brethren that average 300-450 miles per tank. With Tesla’s cars seeing 200+ miles of range, you can understand why they grabbed huge attention when they entered the electric car scene a few years back. They offer consumers sleek, luxurious electric cars with mile-ranges at least twice the average of the EV market. Case in point: The Model X can go 218-315 miles (depending on the trim) while the Model S offers 237-295 (same here), making them the two highest mile-range EVs on the market. Of course, as we all know, these cars are not cheap. A strong battery like those offered in the Model X and S are powerful, without being bulky (weight slows cars down), which is why they cost a pretty penny. With prices starting at about $75,000 and going as high as $140,000 for all the bells and whistles included, these cars are out of the majority of shoppers’ price range. While Tesla clocks in at #1 and #2 for mile-range, #3 on the list of highest mile-range is not another Tesla – but the humble Chevy Bolt. 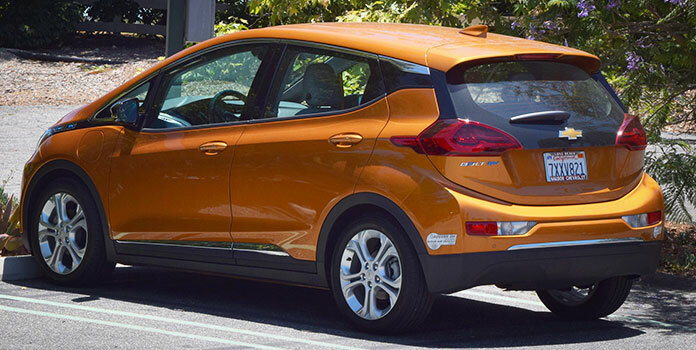 GM impressed car enthusiasts and environmentally conscious drivers alike when the introduced the Bolt’s 238 mile-range, an incredible value at a fraction of the cost of a Tesla (though about on par with the lower-priced Tesla 3). The starting price for a basic Chevy Bolt in the US is $37,495. If we stack the Bolt up against similarly priced EVs, we’ll see that the major difference lies in the mile-range that the Bolt is offering drivers. Nissan’s 2018 LEAF is doing remarkably well, even in pre-sales. The pioneer of the moderately-priced EV car, Nissan’s highly anticipated basic model goes for $29,990 and offers a mile-range of 150. There’s also the Volkswagen e-Golf, which goes for $30,495 and offers a 125 mile-range, and Hyundai’s Ioniq Electric which sells for $29,500 with 124 mile-range. Before the existence of the Chevy Bolt, one would have to spend more than double the cost to get to the next level of mile-range (read, 200+). The Bolt narrows the price gap significantly while maintaining Tesla-level performance numbers. While many are still very eager to get their hands on the reasonably priced Tesla Model 3, which boasts a 220 mile-range with a starting price of $35,000, the company’s production bottleneck has allowed the Chevy Bolt to sneak in and claim the market share of moderately-priced, high mile-range EVs. GM officially launched sales in the US in December of 2016 and have sold more than 20,000 vehicles within 12 months. Following a slow start at the beginning of the year, where sales hovered around 1,000 vehicles per month, November 2017 saw nearly 3,000 cars sold. The Bolt has been approved by the IRS for a full electric vehicle tax credit of $7,500, putting the car’s final price at just under $30,000. What’s more, various states such as California offer additional rebate and credits such as a Clean Vehicle Rebate worth $2,500 and unrestricted access to the carpool lane! In cities like Los Angeles or San Francisco with heavy traffic, these perks can really tip the scales in the Bolt’s favor. When it comes to charging your EV, the Chevy Bolt stacks up similarly with most mass-priced electric vehicles. While Chevy can’t compete with Tesla, which has nearly 1,000 supercharger stations around the country, it can hold its own when it comes to charging your vehicle at home quickly. 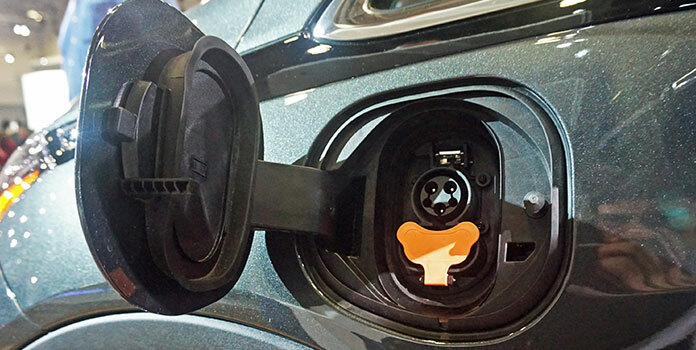 While plugging your car in at home can be as easy as plugging in your cell phone, it will admittedly charge at a snail’s pace on a normal 120-volt charger (4 miles per hour to be exact). To see any quick results in terms of charging the Bolt, you’ll want to invest in a 240-volt charger for your home, which will allow you to easily charge your battery overnight. If you drive a lot, or maybe your travel keeps you from parking your car overnight in the same place consistently, you’ll probably be interested in using public DC Fast Chargers. These ultra-fast stations can charge 90 miles of range in 30 minutes. Unfortunately, GM stated that it has no intention of investing in public DC fast chargers. Thus, it looks like the company’s main idea is to target consumers who are planning to charge their Bolt overnight at home. While the Chevy Bolt does not come with any type of auto-pilot or drive assist program like other recently released EVs, it does sport a a handful of high-tech features. Like most cars manufactured today, the Bolt comes with a 10.2 inch navigation screen and provides a myriad of driver aids like cross-traffic alert, blind-spot alert, forward collision alert, and pedestrian braking. On higher trims you can add a feature that alerts you when you are veering out of your lane. It has both a rear view camera and a 360 degree camera, and various driver modes like “Teen Driver”, which allows you to control the car’s maximum speed. Chevy has also provided all trims with a 4G LTE onboard Wi-Fi hot spot, capable of connecting up to 10 cell phones. In addition to these fringe benefits, the Bolt earned a top safety rating from the Insurance Institute for Highway Safety, making it not only environmentally safe but also secure for passengers at high speeds. 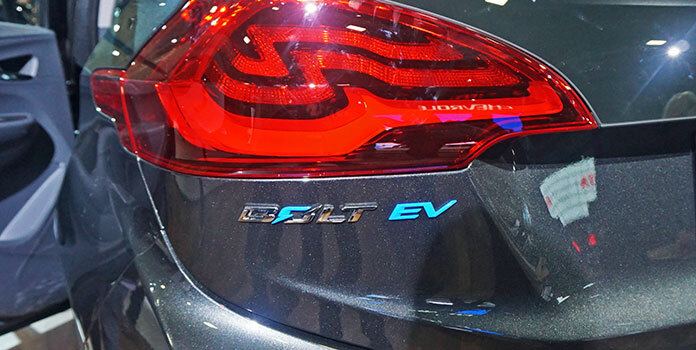 The Chevy Bolt’s competitive price and high mile-range give it a unique position in today’s EV market. How it will fare once Tesla is able to start spitting out the Model 3 is yet to be seen. While competition is constantly expanding and electric vehicles continue to gain more exposure to potential buyers, EVs still make up a very small percentage of all global cars on the road. To be precise, they make up just 0.2 percent of passenger light-duty vehicles –not trucks — globally (pg. 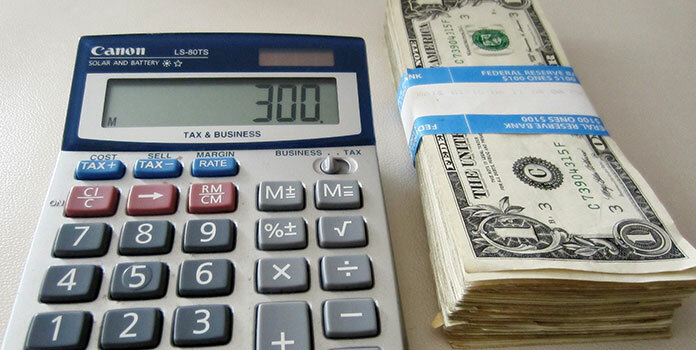 6), and contribute to just 1 percent of all US car sales annually. As more companies like GM release mass-priced electric vehicles that can hold their own against conventional cars, and governments at the state and federal level continue to support these endeavors, drivers will be able to not only save on their gas bills, but contribute to creating a cleaner environment.